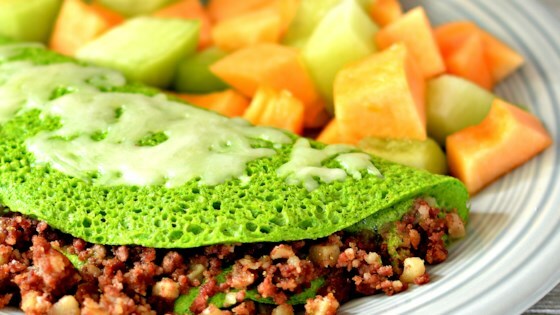 "Spinach, eggs, and corned beef hash make for a great omelet!" Combine eggs and spinach in a blender. Blend on high speed for 1 minute. Scrape down the sides of the blender. Pulse until spinach is fully blended into the eggs, about 1 minute more. Pour hash into a microwave-safe bowl. Heat in the microwave until thoroughly warmed, about 1 minute. Season with black pepper. Spray a nonstick skillet with cooking spray; place over medium heat. Pour in egg-spinach mixture. Cover with a lid. Cook until top is barely set, about 5 minutes. Place corned beef hash over 1 side of the omelet. Slide onto a plate, using the skillet to fold the other side on top. Sprinkle mozzarella cheese over omelet. This hearty casserole is meaty, cheesy, and so delicious. This is a beautiful dish. I don't care for canned hash but chorizo or Spam are great fillings. This was a fun and creative idea and creates a lovely omelet. Thank you for this great idea!